Largest of the three siblings, Nerth is more muscular than his brother and is quite clumsy. He can be a bit of a brute but cares a lot for his two siblings and adoptive parents. He constantly fights with the other pack males and is thought to be the next likeliest candidate for next pack leader but is too much of a valued member to be case out of the group. Likes:Dominating others, fighting, wrestling, competing, pretty she-dragons, making “lesser” creatures (non-dragon kind) fear him and bring him treasure, raiding enemy kingdoms for valuable treasures. 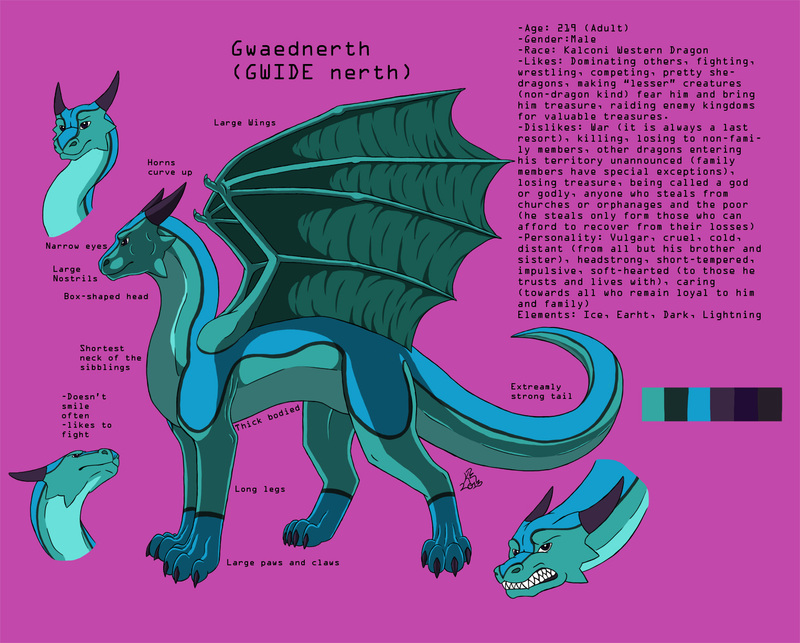 Nerth came from the east, past the swamp that boarders the valley he currently lives in with his adoptive family. It is an open grassland and was cast out of his family when he tried to get too friendly with one of his cousins. He traveled alone for a while and found his way into the valley where he currently lives. He was the last to come into the family and has the hardest time integrating to the new life styles in the pack. All types of terrain. The pack lives in a valley that boarders a mountain range in the north, grate lake on the west, a forest in the east and a jungle/swamp in the south. Largest of the siblings. Muscular and thick bodied. He has a long strong tail and fairly large wings. pronounced GWIDE-nerth, and nicknamed Nerf, he is the middle child of the adopted family consisting of his younger (also adopted) sister Ni Lu and older (and adopted) brother Rong Kun. He is the most boisterous of the three and is the most violent. He often leaves the pack to find pretty dragonesses and raid other dragons of their treasure. He surprisingly has never been caught, but that might be due to the fact that he beats anyone senseless if they do catch him. He is the strongest of the siblings but is often out witted by Ni Lu and out smarted by Rong Kun. He respects and cares for them greatly but doesn't like to show it. He often bullies the others around but is eventually put in his place. What is a Kalconi Western Dragon? Kalconi is a specific species of western dragon. They are medium sizes and round muzzles with a box-like head. They have not tail extensions or decorations (horns, spikes or frills). The horns are typically straight but some can have horns curving up or down. They can have any number of "spikes" protruding from the cheeks. The larger/longer the spikes the older the dragon (as the spikes grow the weave along the body and become more flexible) . Having large nostrils, they have great sense of smell and rely on that more than sight as most of them are nearsighted (stuff in the distance is blurred). They live in large family groups with one or two males dominating (often the pair are brothers that are close in their relationship) a harem and their children. The males will often fight to the death to take over a harem and are fairly aggressive towards other males, even of other species. When males reach the adolescent age they must either leave the pack or submit to the leading male and become a guard on the outskirts of the territory. They are not allowed near the main harem during breeding season and will be chased off forever if they are found too close on purpose (they have trials to determine if the young males are there by accident or on purpose). It is very rare to see the males stay with their families to adulthood. Females come into heat two times a year and pregnancy will last for about half a year. So they can only be impregnated once a year and they can produce up to three eggs but typically only produce two. They normally live in the plains but can sometimes be seen valleys.